A pedestal sink is one with a column base supporting a sink bowl, with no cabinet or vanity top. The sink fits inside of a small bathroom where space is limited. If you are installing a pedestal sink, there are several measurements to consider. Each measurement applies to a different part of the sink. 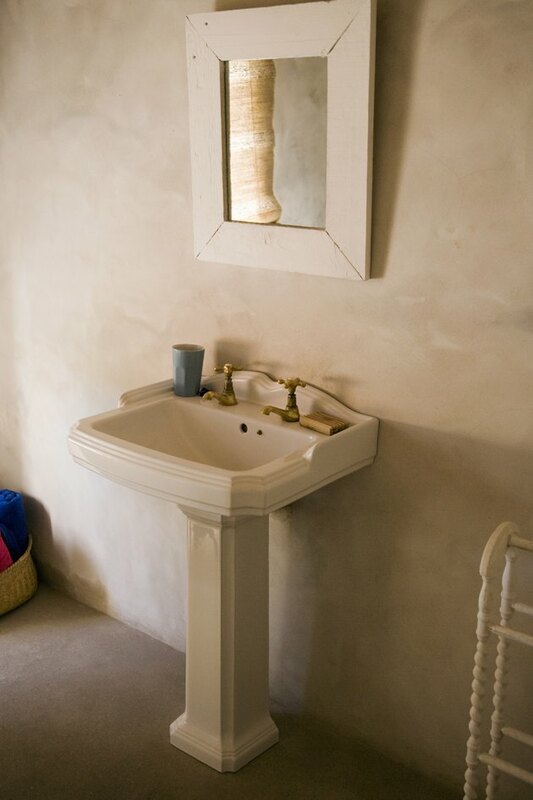 The size of your pedestal sink should match your bathroom space. The height of most pedestal sinks is between 33 and 34 inches. This standard size suits most adults and allows for easy operation of the handles and convenient access to the sink bowl. At this height, the pedestal sink fits easily into any bathroom. It is lower than hanging vanity cabinets, so it does not interfere with these appliances. Standard bathroom cabinets are 34 inches high. This height, however, may interfere with window sills. The length of the pedestal sink varies based on your model and manufacturer. However, most pedestal sinks measure 22 to 24 inches wide. This is the total distance across the sink, from side to side. This measurement is important when figuring out which type of pedestal sink to install in your bathroom. You will need at least this much space in order to install the sink. However, the length measurement applies to the longest measurement of the top of the sink, not the bottom pedestal, which is much smaller in diameter. The width of the pedestal sink is also important when installing this appliance. The width applies to the distance from the front to the back of the sink at its widest point. If you're installing the sink against the wall, this is the distance it will protrude from the wall. Measure out this distance from your wall at the height of the pedestal sink to determine if you have room to install it. The other measurement encountered when choosing a pedestal sink is the faucet mounting measurement. This applies only to the type of faucet you plan to install in the pedestal sink. Most pedestal sinks have pre-drilled holes to install a faucet. The holes must line up to match the mounting shafts on your faucet. A typical pedestal sink includes pre-drilled center set faucet holes, each spaced 4 inches apart on center, or 8-inch spaced holes for a wide-spread faucet. Match the pedestal sink holes to your particular type of faucet for a proper installation. What Is the Capacity of a Sink?